Fall is one of our favorite times of year and one reason why is all the delicious flavors it brings into the kitchen! Soups, crockpot meals, chili, butternut squash, and PUMPKINS! Lucky for us, pumpkin is not only delicious and easy but also healthy! 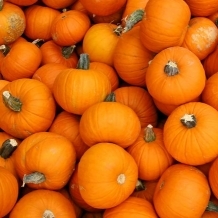 Today we're sharing Five Healthy Food Swaps, pumpkin edition! 1. Pumpkin Pie is a necessity this time of year and we've found a way to make it even better. This crustless, low-calorie Pumpkin Pie from Foodie Fiasco is just what your next meal needs. 2. Speaking of pumpkin pie, serve up a treat anytime with this easy and delicious Healthy Pumpkin Pie Smoothie. 3. Want to try pumpkin in a savory way this fall? Check out this Two Ingredient Fresh Pumpkin Pasta. Try with some simple feta cheese or a delicious pesto for a dinner that's deceivingly impressive. 4. Nothing makes for a better morning than doughnuts and now you can have them without leaving the comfort of your own home! Fall in love with these Pillsbury Grand Pumpkin Doughnuts, that the whole family will love. 5. We couldn't make a Fall Faves list without Chili! Mix up your go-to recipe with this Healthy Pumpkin Chili from the Glowing Fridge.